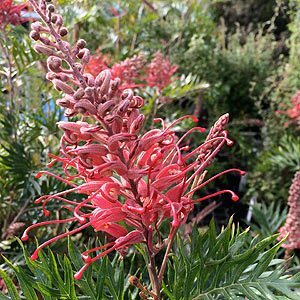 One of the best know of all of the Grevillea hybrids, Grevillea ‘Robyn Gordon’ has certainly stood the test of time. Bred in the 1970s, it is still grown widely in Australia as well as overseas, one of the easiest to grow, wonderful flowers and a great bird attracting plant. 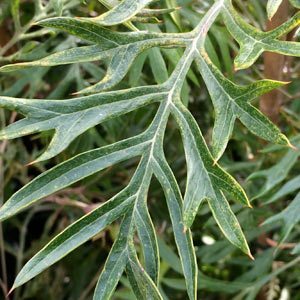 Why is Grevillea ‘Robyn Gordon’ regarded as such a good plant ? It flowers almost year round in good conditions, and what garden does not benefit from that. Good green foliage through the year, however it is the flowers that the plant is grown for. A Grevillea banksii x G. bipinnatifida hybrid and has been popular for its flowers, its compact habit and easy care nature. Growing well in all but clay or water logged soils it is a plant that can be tip pruned to help maintain a smaller size and a bushy habit. Like all Grevilleas, a position which is well drained and where root disturbance will be avoided is important. Mulch around the plant to maintain a cool root run, however keep the mulch away from the stem of the plant to prevent problems. You can prune back the spent flower heads immediately after flowering. This not only tidies up,the plant, it also promotes a bushier habit. Used widely in native gardens, as a backdrop in the garden border or as a feature plant. It can also be planted as an informal hedge. Popular for the flowers as well as for attracting native birds. Foliage – Deep green deeply lobed and textured. Cultivation around the root system causing root damage.